Possible responses of species biogeochemical niches to long-term changes in the abiotic and biotic environmental conditions (possible evolutionary changes in the elementome of species). Authors hypothesize that each species has an optimal function related with its niche traits and thus an optimal content of the distinct bioelements. Figure: Peñuelas, J. et al. Ecology 2019. Every living creature on Earth is made of atoms of the various bioelements (elements used by living organisms) that are harnessed in the construction of molecules, tissues, organisms and communities, as we know them. The most common bioelements are: hydrogen (H) 59%, oxygen (O) 24%, carbon (C) 11%, nitrogen (N) 4%, phosphorus (P) 1% and sulfur (S) 0.1-1% (percentages of total number of atoms in organisms), but there are other bioelements, normally present in low concentrations such as potassium (K), magnesium (Mg), iron (Fe), calcium (Ca), molybdenum (Mo), manganese (Mn) and zinc (Zn). Organisms need these bioelements in specific quantities and proportions to survive and grow. Distinct species have different functions and life strategies, and have therefore developed distinct structures and adopted a certain combination of metabolic and physiological processes. Each species is thus also expected to have different requirements for each bioelement andbe characterized by an specific bio-elemental composition. 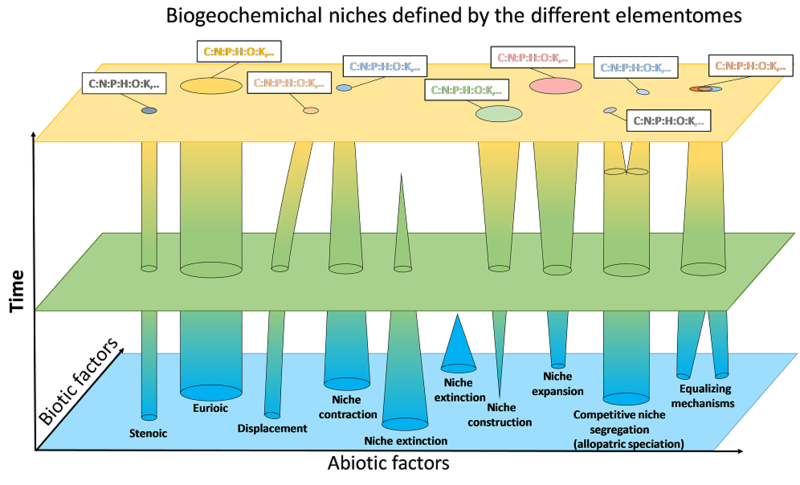 In a new study published in the journal Ecology authors propose that a “biogeochemical niche” can be associated with the classical ecological niche of each species. Authors show from field data examples that a biogeochemical niche is characterized by a particular elementome defined as the content of all (or at least most) bioelements. “The differences in elementome among species are a function of taxonomy and phylogenetic distance, sympatry (the bioelemental compositions should differ more among coexisting than among non-coexisting species to avoid competitive pressure), and homeostasis with a continuum between high homeostasis/low plasticity and low homeostasis/high plasticity”, explains Prof. Josep Penuelas from CREAF-CSIC Barcelona. The biogeochemical niche hypothesis proposed in this paper has the advantage relative to other associated theoretical niche hypotheses that it can be easily characterized by actual quantification of a measurable trait: the elementome of a given organism or a community, being potentially applicable across taxa and habitats. The changes in bioelemental availability can determine genotypic selection and therefore have a feedback on ecosystem function and organization. “Further studies are warranted to discern the ecological and evolutionary processes involved in the biogeochemical niche of all types of individuals, taxa and ecosystems. The changes of bioelements availability and use at long timescales should determine phenotypic selection and therefore also ecosystem function and organization, and, at the end, the evolution of life and the environment”, says Prof. Jordi Sardans from CREAF-CSIC.